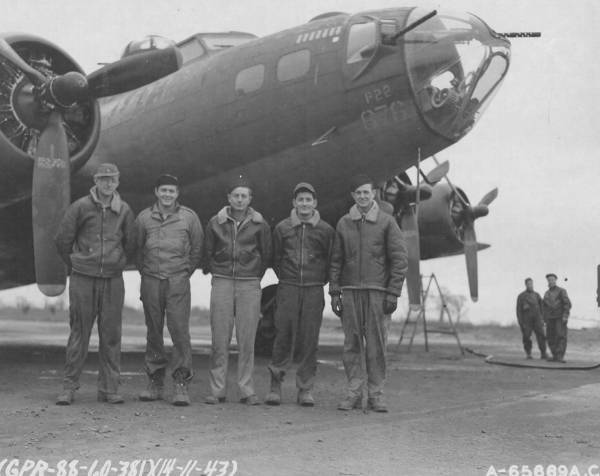 Delivered: Dallas 9/7/43; Love 29/7/43; Kearney 1/8/43; Topeka 12/8/43; Assigned: 482BG Alconbury 24/8/43; Transferred: 532BS/381BG [VE-E] Ridgewell 19/9/43; MIA Tours 5/1/44 Pilot: Jack Zeman, Radio Operator: Burton Givan, Ball Turret Gunner: Harve Leroux, Waist Gunner: Ray Chevraux (4EVD), Co-Pilot: Otis Montgomery, Navigator: Frank Bisagna, Engineer / Top Turret Gunner: John Sinquefield, Waist Gunner: Francis Cater, Tail Gunner: George Day (5POW), Bombardier: Bill Walker (KIA); Enemy aircraft, crashed Les Hunes, a mile W of Aubigne-Racan, Fr. MACR 1962. BABY DUMPLING.